President Barack Obama says that 2014 was “the planet’s warmest year on record.” But that’s not entirely accurate. Several major climate monitoring organizations have found that 2014 is more likely than any other year to have been the warmest. But statistical uncertainties inherent to calculating global temperatures make the president’s definitive claim problematic. This sounds like an undisputed fact, but it is not. 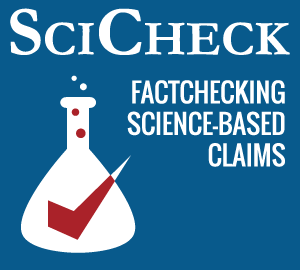 The National Oceanic and Atmospheric Administration, NASA and the Japan Meteorological Agency all did report that 2014 was the warmest year since record-keeping began in the late 1800s, but there are uncertainties to that finding. For example, NOAA reported that the global average temperature for 2014 was 0.69 degrees Celsius (1.24 degrees F) above the 20th century average. This departure from the average is known as the temperature anomaly. 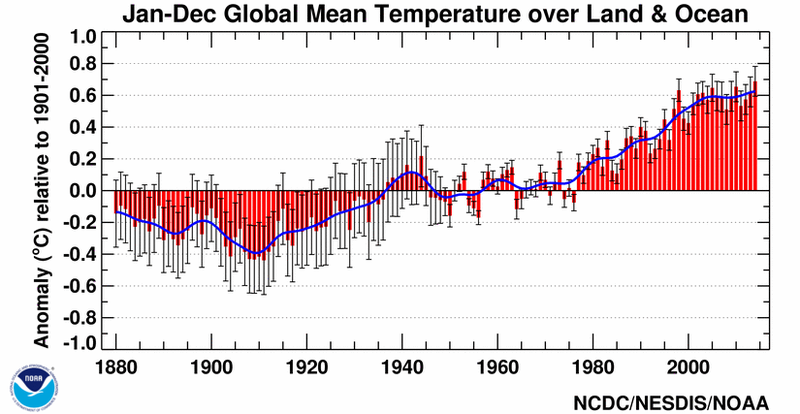 The 2014 temperature anomaly (0.69 degrees C) ranks first among all years dating back to 1880. However, that finding has a margin of error of 0.09 degrees C — which means there is a 95 percent chance that 2014’s temperature anomaly falls between 0.60 degrees C and 0.78 degrees C.
The anomaly for both 2005 and 2010 was 0.62 degrees C. This falls inside the 0.60 to 0.78 range for 2014’s 95 percent margin of error, which means there is a chance that other years were warmer than 2014. The United Kingdom’s Met Office, which studies climate as well, found that the uncertainties did not allow 2014 to take the definitive top spot in the rankings. It said 2014 was statistically tied with 2010. 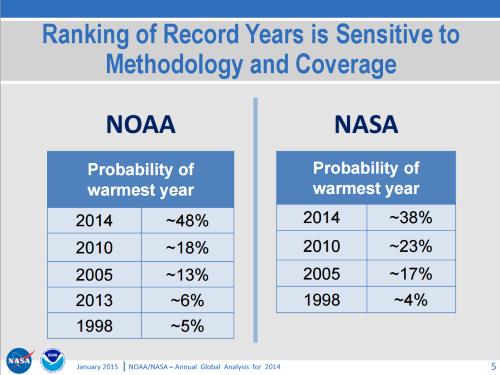 NOAA: Evaluating the temperature of the entire planet has an inherent level of uncertainty. The reported global value is not an exact measurement; instead it is the central value within some range of possible values. The size of this range depends on the method used to evaluate the global temperature anomaly, the number and placement of the stations used in the analysis, and so on. As the chart shows, NOAA found that the likelihood of 2014 being the warmest year was approximately 48 percent. NOAA considers anything between 33.3 percent and 50 percent to be “more unlikely than likely,” so 2014 was more unlikely than likely to be the warmest year on record. Between 50 percent and 66.7 percent would be deemed “more likely than not,” and 66.7 percent to 90 percent would achieve “likely” status. Arndt, Jan. 21: This may seem pedantic, but it’s an important point: there is a warmest year on record. One of the 135 years in that history is the warmest. 2014 is clearly, and by a very large margin, the most likely warmest year. Not only is its central estimate relatively distant from (warmer than) the prior record, but even accounting for known uncertainties, and their known shapes, it still emerges as easily the most likely warmest year on record. Though the question of “warmest on record” is hotly debated, the long-term trend is more important to understanding the climate than the temperature of any given year — another point Obama made in his weekly address. Obama, April 18: Fourteen of the 15 hottest years on record have all fallen in the first 15 years of this century. That long-term data is unequivocal, and shows a significant warming trend, as NOAA’s chart below shows. Though the president is on the right track regarding 2014’s temperatures, the addition of “most likely” to this talking point would put him on stronger ground.